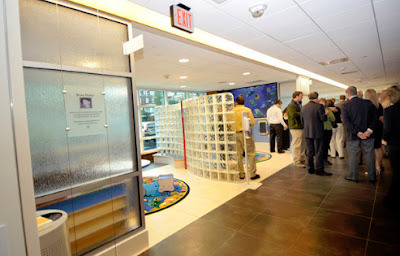 Allentown, PA - St. Luke's Health Network recently held a dedication ceremony for "Mimi's Place", the W2A designed new Pediatric Emergency Department waiting area at the health network's Allentown Campus. Children visiting the Pediatric Emergency Department at St. Luke's Allentown Campus, can now wait in a newly renovated, age appropriate space. 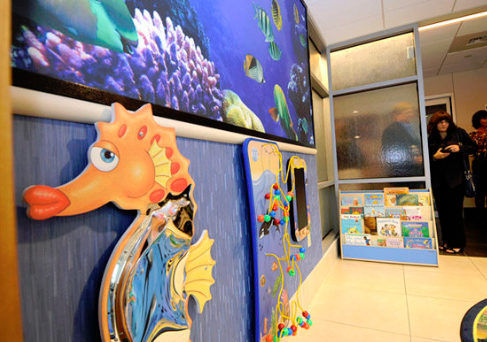 The “nautical” design features a “serpentine” separation wall with LED “wave” lighting, “sailboat” play area, interactive “ocean creature” game displays, “bubble” area carpets, and child-sized furniture.